The main protagonist of the story, Alexander is a young Qwaser of Russian origin that controls the element of Iron, with which he can manipulate the said element on a molecular level, thus being capable not only to morph it in any form he wishes, but also create extreme heat or cold. He was held captive and trained with the other Qwasers into harnessing his powers, and survived the brutal ordeal thanks to the affection received from an older girl named Olja, and whose murder by the Qwaser of Gold he witnessed. He received a large scar on the left side of his face from the same Qwaser. The scar is shaped like an Eastern Cross, and tends to bleed heavily when he draws upon his powers. Sasha appeared out of nowhere on the grounds of St. Mihailov, and was quickly accepted into the school as a student of class 1-A, the same that Mafuyu Oribe and Tomo Yamanobe attend. He became Tomo's protector because of her resemblance to Olja. 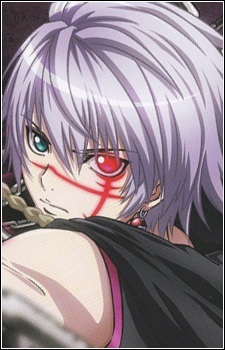 Silver-haired with blue eyes, Alexander, or Sasha for short (though he allows only those close to him to call him by this nickname) is usually extremely cold, harsh, and serious, although his weakness for borscht, his favorite dish, can soften him. He slowly changed and warmed to those around him, especially Mafuyu, though he remains extremely fierce when fighting other Qwasers. Usually he fights wielding an enormous black scythe that is at least twice his size. Sometimes he tends to comment on things in Russian.